This set of 3 stainless steel strap hinges is a terrific option when you're looking for a clean, contemporary hinge. These hinges can be used for carriage house doors, shed doors, or gates. they fit doors and gates with a maximum thickness of 5". In the square hole on the strap, you insert the included stainless steel (grade 18-8) carriage bolt for additional rigidity to the installation (a through-bolt). This is a called a lift-off hinge because once installed, the gate or door can be lifted off the pintles if needed. If you'd like to prevent the gate being lifted off, simply install the upper pintle facing down. These stainless steel hinges are made of marine grade 316 stainless which offers the best in rust resistance. Also available in stainless steel with black powdercoat. Suitable for in-swinging and out-swinging gates, but the hinges must be installed on the side of the gate that it opens toward. Sold as a set of 3 (three pintles + three straps). Pintle: 5.25"h x 1.5"w x 1/2"diameter. Select the thickness of the gate this will be installed on. Please find links to where you can purchase different sizes and quantity sets in the Alternate Configurations section below. Interested in more info about strap hinges? Read about tips and installation here. View or Download a cutsheet for the hinge on our Technical Information Page. 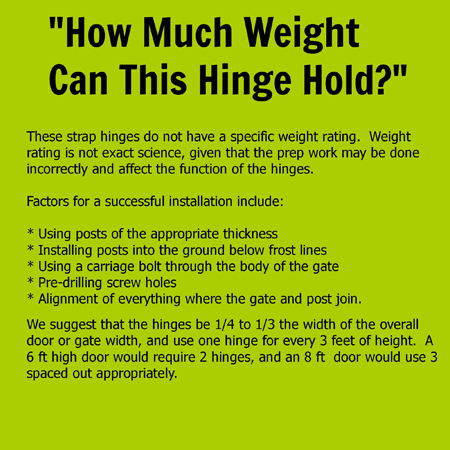 The rule of thumb is that the length of the strap hinges should be 1/4 to 1/3 of the width of your gate or door. If the gate or door is over 6' high, you should add a third hinge. These hinges can be used for carriage house doors, shed doors, or gates.